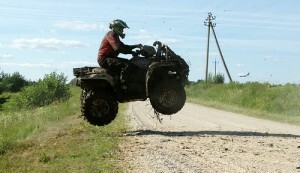 This page includes a brief summary of provincial and state laws regulating ATV and OHV use. It is not intended as an absolute reference as laws are subject to change without notice, and many potential prohibited acts may be covered by other legislation or statutes. It is recommended that you consult with the latest version of state statutes or provincial legislation. General prohibited acts that may not be covered by specific OHV legislation include trespassing on private property, unlawful use of OHV on public highways, reckless use of off-highway vehicles, operation of off-highway vehicles while under the influence of drugs or alcohol, damage to public or private property or damage to natural habitats or protected areas which are all unlawful in every province and state. Preamble ATV's and other off-highway vehicles are regulated by the state of Texas under the Texas Transportation Code, Parks & Wildlife Code. These statutes cover the use of off-highway vehicles on public and private lands. All residents of Texas are required to title their off-highway vehicle and are required to register their off-highway vehicle under the Texas Off-Highway Vehicle Program for operation on public lands. A valid decal must be displayed on the vehicle.Non-residents are also required to register their off-highway vehicles under the Texas Off-Highway Vehicle Program for operation public lands. A valid decal must be displayed on the vehicle. Operation of off-highway vehicles on public roads or highways is prohibited except to cross such roadways. It is unlawful for an operator to carry a passenger unless the vehicle is designed to carry passengers. No child under the age of 6 may operate an off-highway vehicle on public lands. All operators under the age of 14 are required to be directly supervised by a parent/guardian or a person over the age of 18 who is authorized by the child's parents/guardians. Children between the ages of 6 and 11 are limited to operating an off-highway vehicle with an engine size 70cc or smaller.Children 12-15 are limited to operating an off-highway vehicle with an engine size 90cc or smaller.Children 16 years of age or older are permitted to operate an off-highway vehicle with an engine size greater than 90cc. All operators riding on public lands are required to pass the Texas ATV Safety Course or hold equal certification from another state. All off-highways vehicles operated on public lands in Texas are required to have a working muffler system that restricts noise emissions, and a working U.S. Forestry service approved spark arrestor. All off-highway vehicles operated on public lands between one-half hour after sunset to one-half hour before sunrise or at times of limited visibility are required to have working headlights, taillights, and brake lights. All operators and riders riding on public lands require DOT approved helmets and adequate eye protection. A person may not operate an all-terrain vehicle on public property in a careless or reckless manner that endangers, injuries, or damages any person or property. For the best AMSOIL synthetic oil in Houston, call ADR Oil Company at (832) 445-7530. ADR Oil provides premium AMSOIL Oil in Humble. They're here to help you find the right synthetic products for all your engine needs. Shop online today.